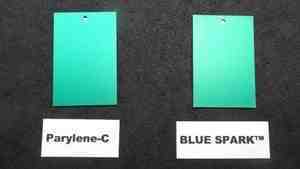 BLUE SPARK™ PARYLENE C is a UV Fluorescing member of the Parylene Dimer family. 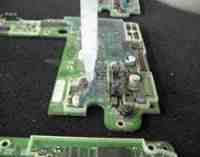 This material is a high performance, high purity dimer designed to produce a parylene polymer film yielding excellent electrical, chemical, and physical properties while allowing for UV Light Inspection. The material has been tested and/or certified to meet or exceed the performance requirements of MIL-I-46058C, IPC-CC-830B, UL 94V-0, UL746, and NASA Low Outgassing (ASTM E595) as a finished CVD Parylene Film. 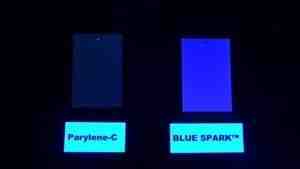 The general physics of BLUE SPARK™ UV Fluorescing and its application methodology offers unique Tin Whisker mitigation performance in a thin film solution. Furthermore, it provides excellent resistance to water, salt spray, inorganic acids, organic solvents, corrosive gases and various other chemical and mechanical based threats. The material polymerizes at room temperature while under vacuum and exhibits good adhesion to most surfaces. Our PRS engineering consultants would be pleased to provide any advice on surface preparation and substrate cleanliness prior to a customer’s chemical vapor deposition (CVD) application process. 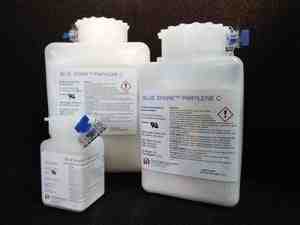 Contact us for more information on our Parylene Dimer and UV Fluorescing process, or request a quote today. Adhesion is a major attribute of the PRS product. BLUE SPARK™ offers increased adhesive strength over conventional untreated Parylene dimers without the addition of adhesion promoters/additives. However, this attribute can be further enhanced during the PRS proprietary dispersion process of manufacturing by addition of processes involving vacuum plasma and a special adhesion promoter. 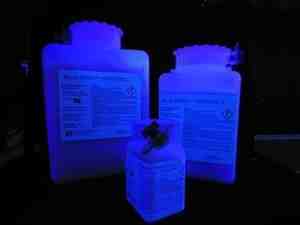 UV FLUORESCING, this material offers the unique ability to inspect the finished Parylene film under UV (Black) Light Inspection while maintaining the high-performance properties offered by Parylene. Tested (PASSES), meets the requirements of, and is Compliant to MIL-I-46058C. Tested (PASSES), meets the requirements of, and is Compliant to IPC-CC-830B. 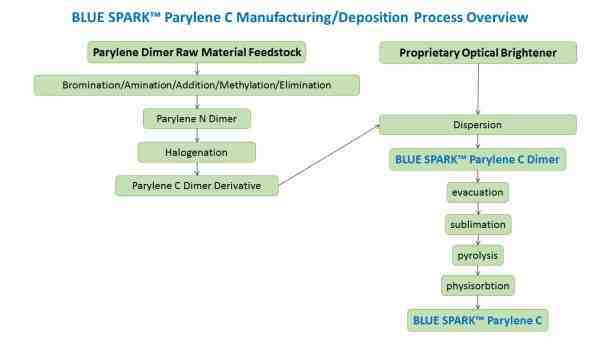 Contact us for more information regarding our BLUE SPARK™ Parylene Dimer UV fluorescing product capabilities, or request a quote today.